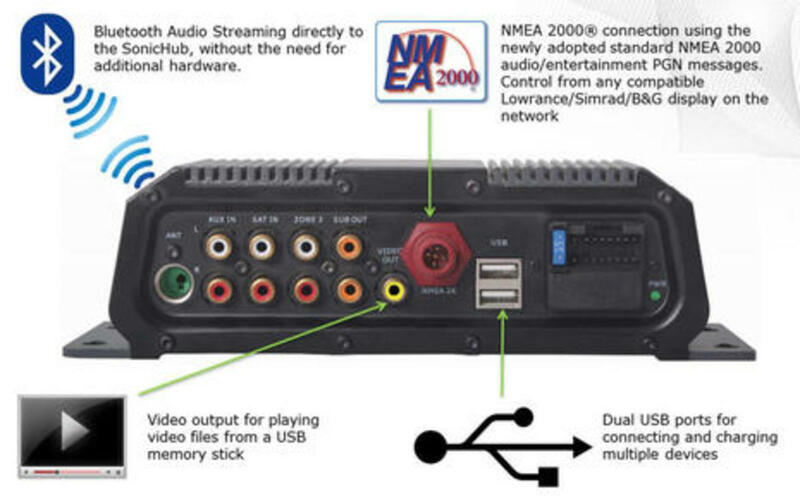 Being able to use your helm&apos;s bright waterproof color screen to run your stereo system has to be one of the most appreciated benefits of multifunction display evolution and the NMEA 2000 network standard. 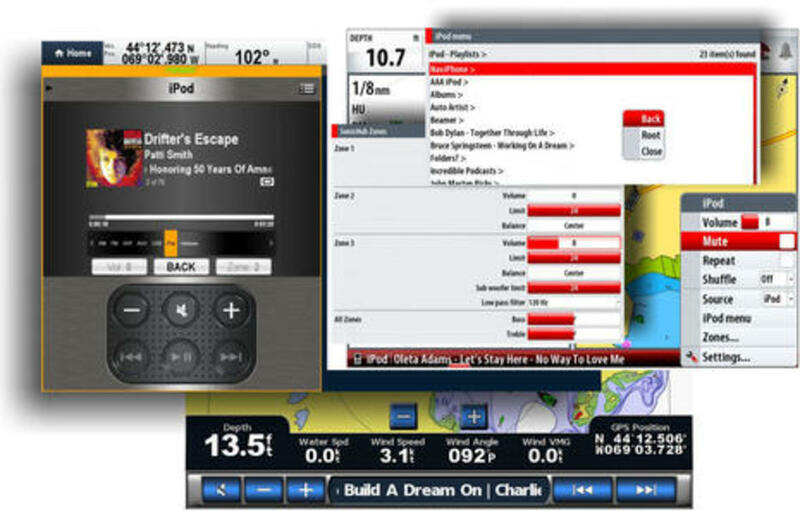 Typically the stereo head unit is installed in the boat&apos;s living area while one or more MFDs serve as remote controls in the cockpit, on the flybridge, etc. The interface can be a simple mute/volume/next menu bar leaving ample screen room for navigation or a screen window with more controls and info. 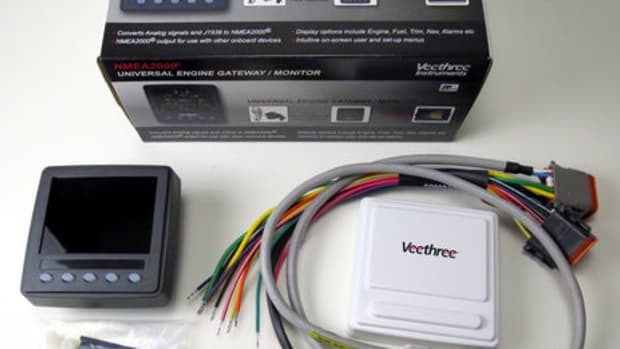 Usually, you can also go full screen to easily browse a phone or iPod full of music, or access the stereo&apos;s deeper settings better than you can on the head unit. And it costs next to nothing! 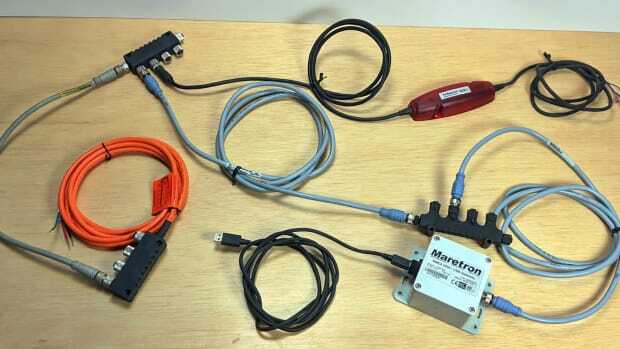 This wonderful feature is now available on every major brand MFD, usually via NMEA 2000 but sometimes via Ethernet. 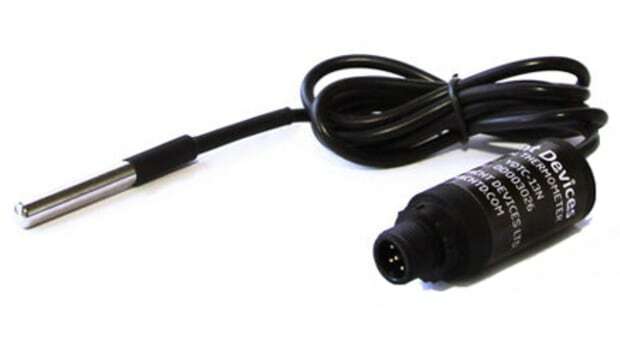 However, as best I can tell, neither the NMEA nor any marine electronics manufacturer ever anticipated this integration. 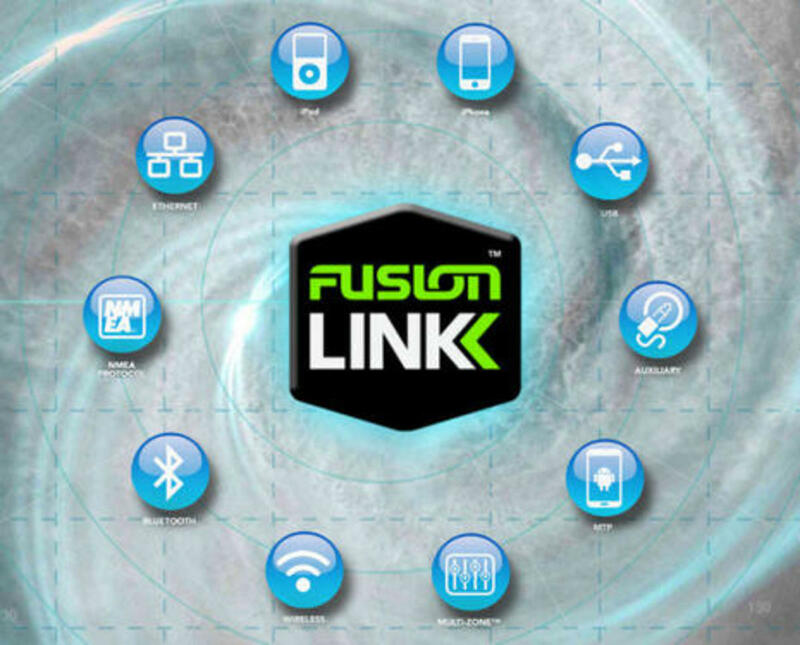 Instead, it was relatively unknown Fusion Entertainment that first decided to reinvent marine audio and then introduced Fusion-Link in 2011 (Panbo was there). 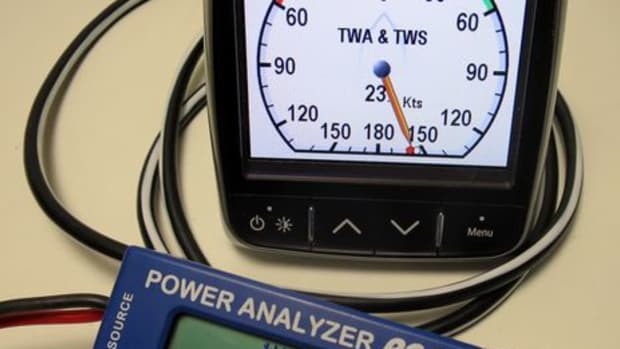 Fusion did not just trailblaze the happy marriage of entertainment electronics with marine electronics (and with the mobile electronics we now commonly use to bring entertainment to the boat), they owned the concept almost completely. If you want stereo control on your MFD system, you get Fusion. But that situation seems about to change rapidly, and while it may be great in terms of healthy competition and consumer choice, we should be careful with our expectations. 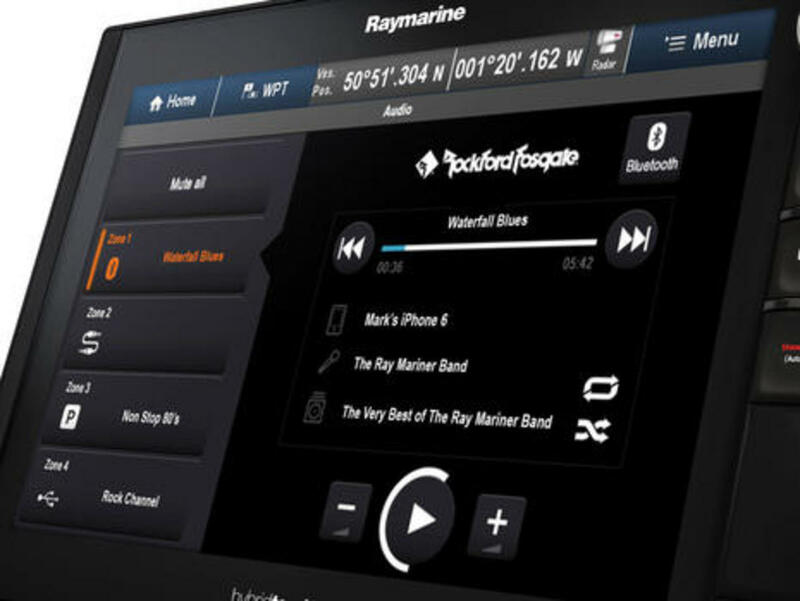 Interestingly, one of the first not-Fusion integrated stereos was announced as a partnership between Raymarine and Rockford Fosgate, and the NMEA 2000 aspect seems a bit muted. 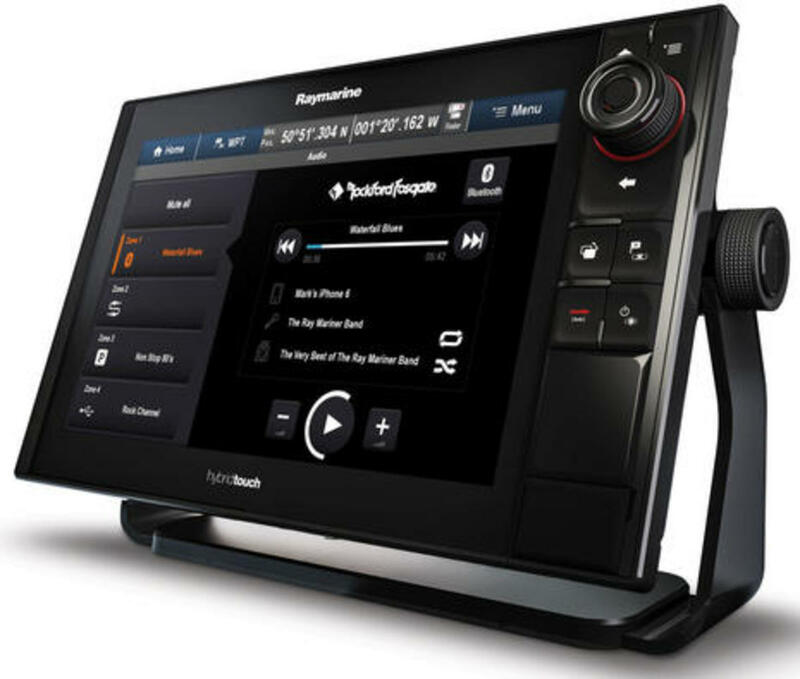 In fact, the release says that the "PMX-5 will integrate via CAN bus to the Raymarine MFD where a custom designed user interface will be displayed," and you won&apos;t find a mention of N2K in the Rockford Fosgate PMX-5 manual either. Similarly, the Boston audio guy in this hilarious PMX-5 "review" video blows right past the CANbus integration, though you will see that this $400 stereo has a lot going for it, including support of both iOS and Android music streaming (which took Fusion a while). The killer feature, though -- and one that Fusion has only talked about so far -- is support for simultaneous dual sources. That means that you could be listening to, say, your favorite FM station on the flybridge speaker zone while the kids are down below enjoying their own source on their own zone. 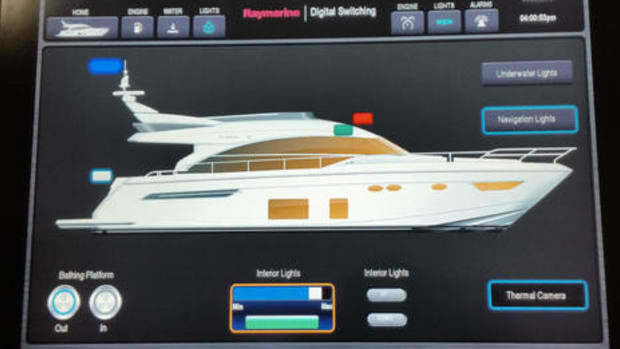 On closer inspection the PMX-5 integration looks darn sweet, at least in product photos, and it will purportedly arrive soon to many Raymarine displays with a new Lighthouse II update, though the feature rich R16 version being teased now (go Ray!) doesn&apos;t include it. 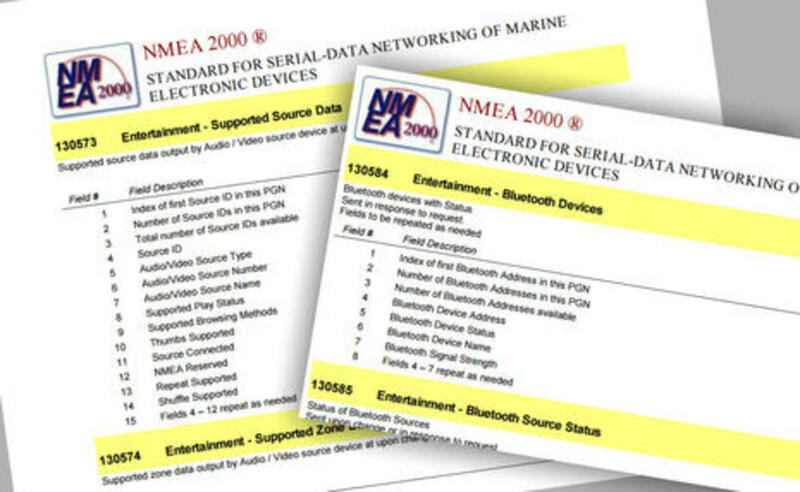 However, it would be no surprise if it&apos;s only partially based on the new NMEA standard entertainment messages, with the other part using custom PGNs worked out between Ray and Rockford developers. 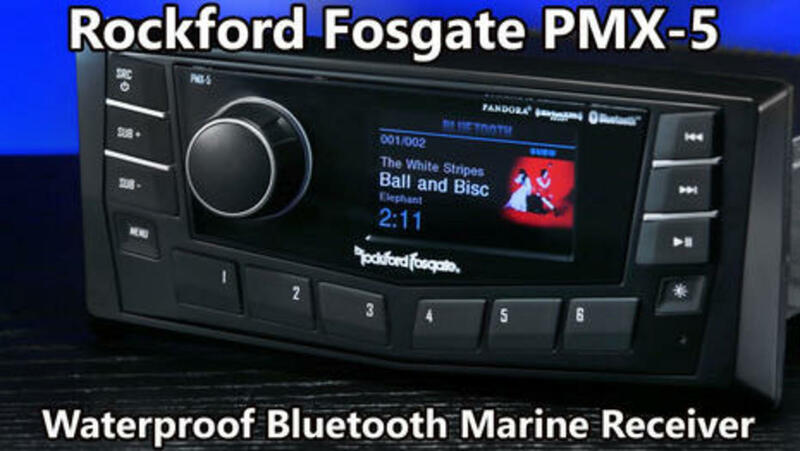 That shouldn&apos;t matter a bit to owners of Raymarine MFDs but it may explain why Rockford Fosgate is not currently marketing the PMX-5 as compatible with other MFD brands. But this may well be a temporary situation. 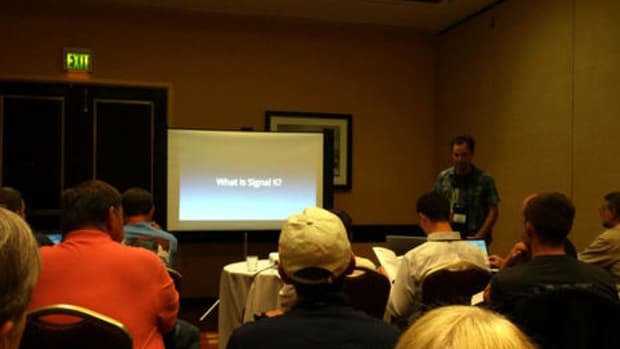 NMEA Director Mark Reedenauer told me that Rockford Fosgate, as well as JL Audio (below) and Clarion, all had representatives volunteering on the entertainment standards committee and also that all are planning on N2K certified products. 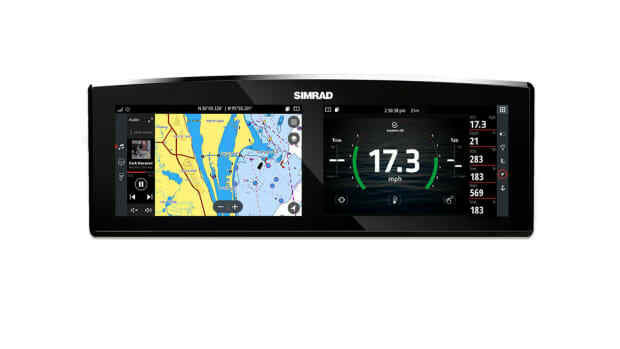 The day may come when you can shop for an integrated marine entertainment system pretty much regardless of what MFD system you have now or may have in the future (Fusion style). And, by the way, check out the coming-soon Rockford Fosgate PMX-8DH system with its optional PMX-CAN N2K gateway. Now say hello to the just-announced JL Audio MediaMaster MM100s, which JL describes as a purpose-built, marine grade audio source unit and a "very important product" for the company. 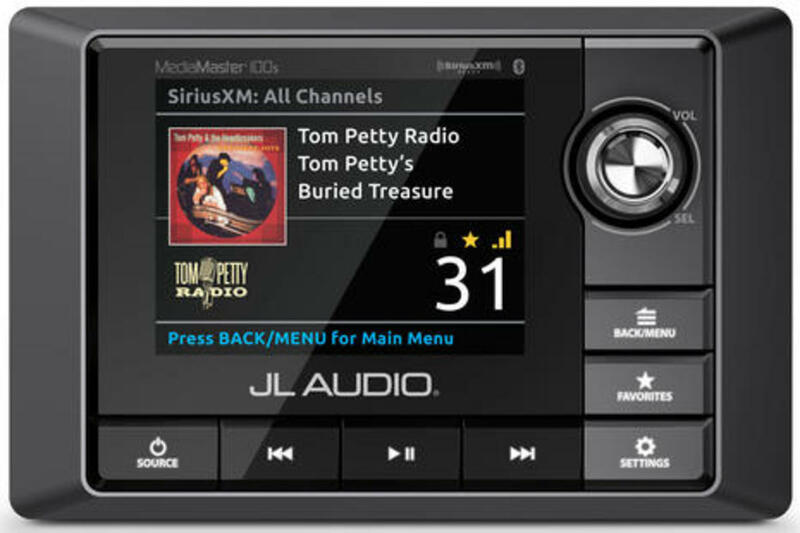 This premium $550 head unit looks gorgeous to me, and I&apos;ve learned over the years that JL marine speakers and amplifiers have a sterling reputation in some demanding parts of the boating world. 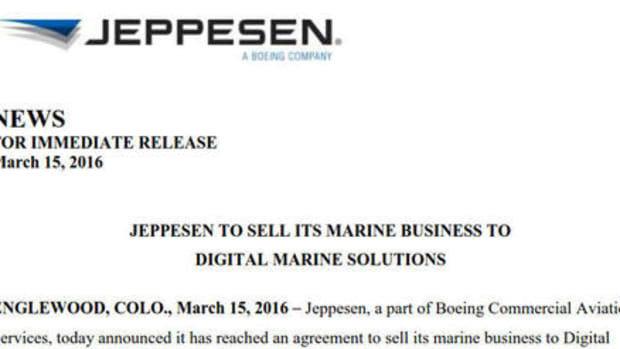 But JL has little experience at stereo head units and having "A NMEA 2K-compliant CAN bus...on board to aid in connection to compatible marine electronics" sounds vague to me. Which MFDs support the standard audio messages and what are the results? My initial integration expectations would be low, but that might change quickly. Actually, most of the major MFD brands have a motivation to support these new stereos that goes well beyond simply trying to please their customers. The elephant in this room is that Garmin acquired Fusion in 2014 (shortly after I wrote about how well Garmin uses FusionLink) and even though Fusion has remained independent in every way I can see, Garmin&apos;s direct marine competitors may have lost some enthusiasm about seeing Fusion gear installed as nicely integrated elements in their larger systems. 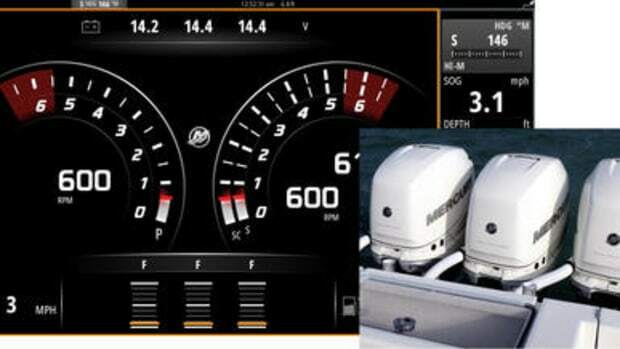 Behold, for instance, the Lowrance, Simrad, and B&G SonicHub2 black box audio system. It looks a lot like the original SonicHub I enjoyed testing in 2010, but with nice improvements like an extra USB port, built-in Bluetooth streaming and Pandora support. Also, note the conspicuous support for the new entertainment PGNs, though again a little special sauce wouldn&apos;t be surprising (could there really be a Pandora like/dislike command now in N2K?). According to industry gossip, though, what&apos;s really different about SonicHub2 is that Fusion had nothing to do with its development and isn&apos;t manufacturing them, unlike the original.